Biology (from Greek: βίος, bio, "life"; and λόγος, logos, "knowledge") is the study of life. 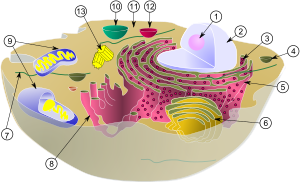 Biology is an information science that is close to computer science and mathematics. The early 2000s was at the point where the conventional views of molecular biology changed rapidly with new views. One of them is the transition from the object-oriented understanding of biology to an interaction-oriented understanding. While organisms may vary immensely in appearance, habitat, and behaviour it is a central principle of biology that all life shares certain universal fundamentals. 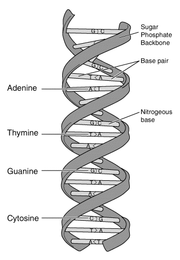 A key feature is reproduction or replication. The entity being replicated, the replicator, in the past was considered to be the organism during the time of Darwin, but since the 1970s increasingly reduced to the scale of molecules. All known life has a carbon-based biochemistry, carbon is the fundamental building block of the molecules that make up all known living things. Similarly water is the basic solvent for all known living organisms. While all these things are true of all organisms observed on Earth, in theory alternative forms of life could exist and some scientists do look at alternative biochemistry. This page was last modified on 8 June 2009, at 23:15.